Part One of Morten Jessen's Henschel Hs 123 eArticle is just released and should be required reading for Luftwaffe experts and air-minded enthusiasts alike. Not only was the Henschel Hs 123 virtually the Luftwaffe's last operational biplane in service (aside from a handful of Nachtschlacht machines), it was a stand-out in a very small category of aircraft -dedicated ground attack- that proved crucial in the Luftwaffe's early conduct of the war. Based on a range of primary sources such as factory documents, Flugbücher, interviews and personnel files, this 21-page feature (part one of two) primarily covers the developmental period from 1935 to 1938 of the superb 'eins-zwei-drei' as the little biplane dive-bomber and ground-attack aircraft was known. The Hs 123 would go on to serve in front-line units of the Luftwaffe literally until there were none left - used up by relentless and arduous service and attrition as Lt. Konrad Pingel's account of strafing Russian T-34's at Kursk during July 1943 that opens the article attests. 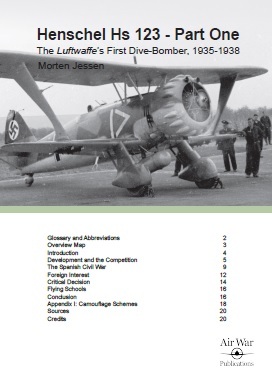 Author Jessen covers the type's early development and also looks at the type's competitors for the RLM's light dive-bomber specification issued in the early 1930s; for example the Fieseler Fi 98 with its wires and struts and the cumbersome gull-winged Ha 137 with its poor flight characteristics - the Hs 123 had single streamlined struts and gear spats and light alloy skinning. I was fascinated to read that while some prototypes had three bladed propellers, production examples didn't because of the cost of the extra blade! Production orders started to arrive during late 1935, the type being manufactured at Henschel's hard-pressed Schönefeld works in Berlin which was also churning out Junkers bombers. Events though soon pushed the Hs 123 into combat. When civil war broke out in Spain the type was quickly shipped to the Nationalists where the 'Angelito' proved durable and the type's performance in the Condor Legion with the creation of the Hs 123-equipped Stuka Kette 88, led by Lt. Brücker won plaudits, stimulating interest from air forces around the world. In fact the Hs 123 was probably the first dive-bomber to see combat anywhere. 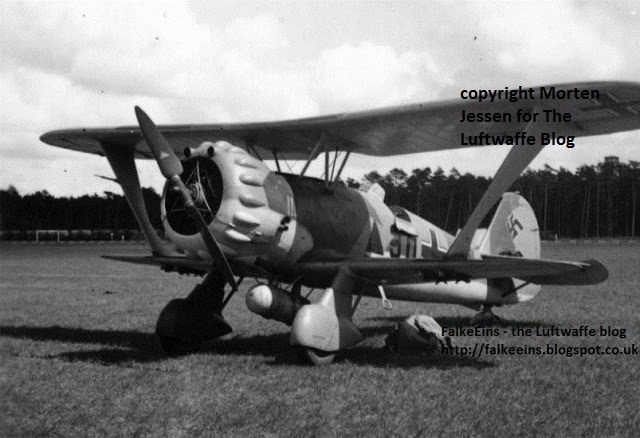 Sales representative and company pilot for Henschel during the mid-thirties was WWI Jasta 20 Albatros 'ace' Alexander von Winterfeldt - who accompanied a shipment of Hs 123s to China during 1938. The twelve Chinese Hs 123s carried out bombing attacks on Japanese warships on the Yangtze river while von Winterfeldt would go on to command units of JG 2 and JG 77 during WWII. Indeed the type's early operational service probably carried far greater impact than even it's supporters could have imagined - from its involvement in the Sudeten crisis, its much more active role with the Condor Legion over Spain in 1936 and 1937 to its critical role in the Polish campaign where the machines of II./ (S) LG 2 undertook key ground-attack duties in von Richthofen's Luftflotte 4 contributing hugely to the defeat of Polish General Kutrzeba's counter-attack threatening the northern flank of German Army Group South. The Poles had never experienced such ferocious and sustained bombing and ground attack. Notably one of the Henschel pilots was a future fighter General -Adolf Galland. And while during the intervening period aeronautical development had moved on and Hs 123 production was ended - the Junkers Ju 87 and Henschel's own dedicated tank-busting Hs 129 were the future - the Henschel Hs 123 again performed during the Blitzkrieg in the West.
" 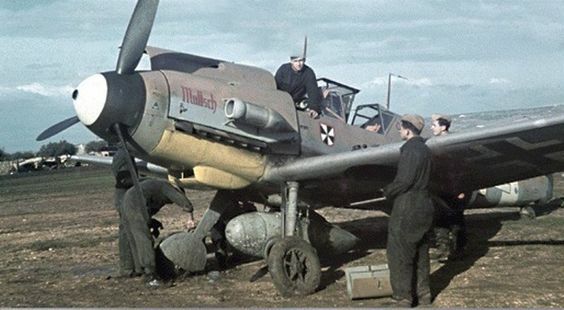 A miniscule 230 or so were taken into service by the Luftwaffe, a tiny investment from which the Luftwaffe squeezed an extraordinary amount of work over the front lines through the astonishingly long period to at least the spring of 1944. Specific details are thin but the battlefield contributions of the Hs 123 seem to have been out of all proportion to the tiny numbers employed. The Hs 123 is probably the most remarkably cost-effective ground attack aircraft of all time and the story of its longevity is genuinely extraordinary..". The final section of Morten Jessen's article touches upon another vital role played by the aircraft: its service in various Luftwaffe training schools. The team at AWP are to be congratulated on coming up with an accurate - and very readable - story. In fact it would appear that the author has taken care to avoid nuts’n’bolts facts in the main text. They are there of course - but mostly in well-presented tables and side bars. This approach serves to heighten 'readability' and interest. As well as a selection of nice clear photos - most of them new to me and including a number from the collection of Jean-Louis Roba - the article features Claes Sundin artworks. These are accompanied by a short description of the 'A' and 'B' schemes, the two patterns laid down by the RLM for the type- worth the price of admission on their own. Of course with digital articles like these you can really get in close to see the detail. Like all AWP eArticles you not only get a great read, but new research and a ready-to-print pdf file for your tablet or device. All for less than the cost of a print magazine which would probably only have a handful of pages dealing with Luftwaffe subjects - if any at all. Recommended.